This Fashionable Beaded Medical Bracelet offers your choice of 3 sterling silver message beads, double strands of 3mm polished Sterling Silver rounds brilliantly accented by 6mm sterling silver rounds to complete the look of this intriguing bracelet! No further discounts on this laser engraved product. 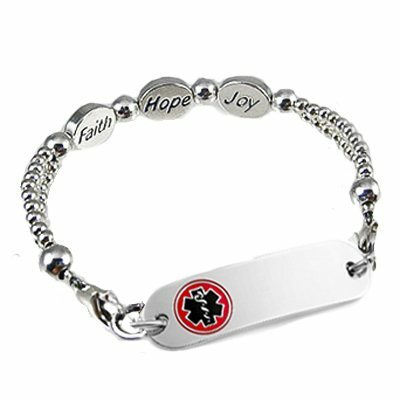 Price includes: One Petite stainless medical id tag with round embossed, enamel filled emblem, laser engraving and interchangeable beaded strand, two lobster clasps..